Coal Seam Gas Mining in our back yard? We don’t think so. In fact… A VERY BIG BYRON – WE DON’T THINK SO! 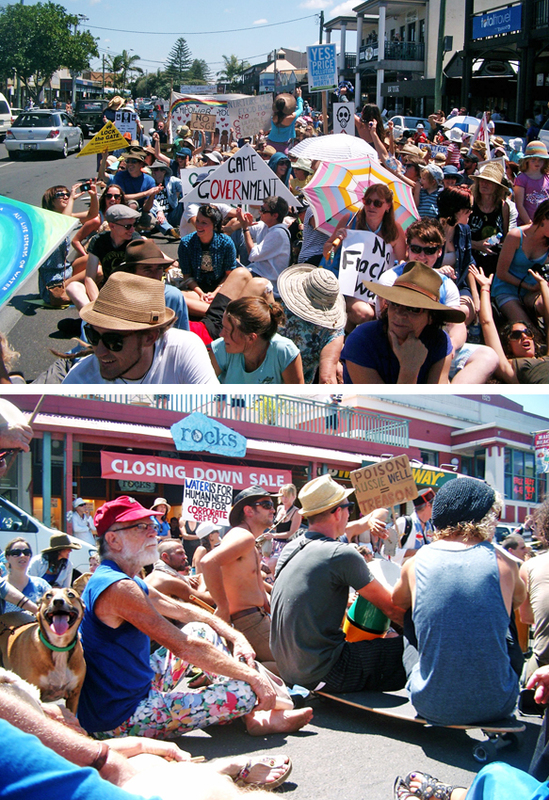 If there is anywhere in this country that is going to object to something so devastatingly major…it will be the community of Byron Bay. 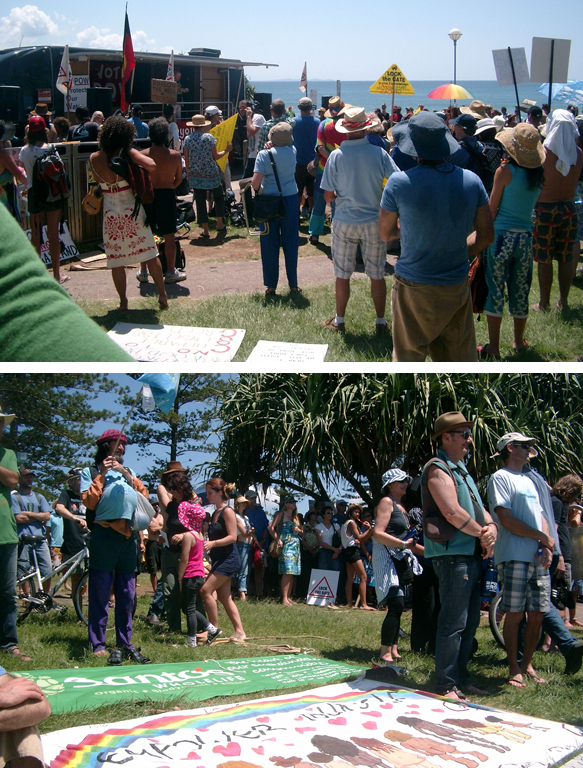 Two thousand strong voices rallied together, unified in one big ‘NO FRACKING WAY’. The president of the Bsane body behind the rally, Anthea Amore, did a brilliant job organising the massive crowd, as did her counterparts… especially when it came to producing a reverse Mexican wave (a sequential collapsing of marchers after taking a drink of ‘fracked’ water from their water bottles). Arj Barker (the MC) was passionate in his delivery, and hilariously so when his American accent designated the premier of NSW as Bury O’Farrell. Arj was serious… Byron was serious… look out anyone who supports such an insidious attack on our basic rights… the right to clean water and the right to everything that flows from it! Top: Check out the backyard! Bottom: Very Mick mixing with the political power brokers. Paul Spooner, Manager of the Byron Community Centre to his right and Jan Barham, Byron Shire Mayor behind. Top: Protestors during the reverse Mexican Wave. Bottom: Every man and his dog… all barking mad. This entry was posted in Community, Lifestyle, People, Uncategorized and tagged Byron Bay, Lifestyle, New South Wales, Poiltical by Very Byron. Bookmark the permalink. The Tweed will be just as strong as Byron in opposing CSG. We’ll all be together in this battle.